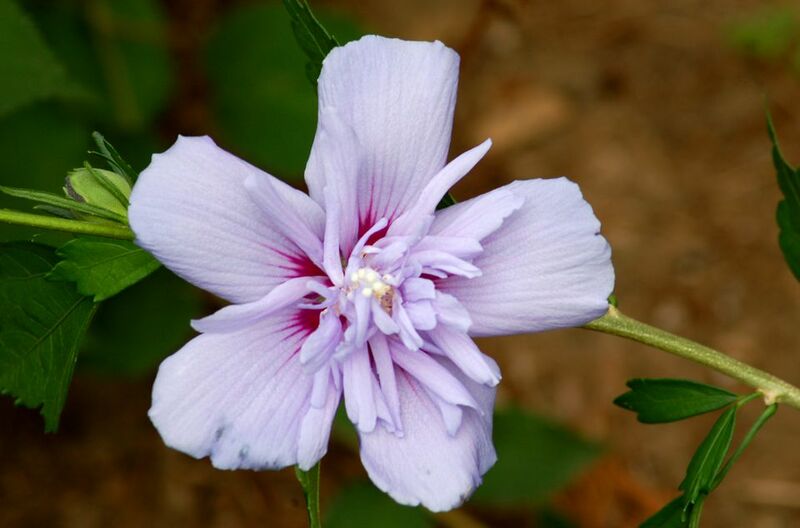 The Blue Chiffon rose of Sharon is an excellent flowering shrub for the late-summer landscape. Plant taxonomy classifies this deciduous shrub as Hibiscus syriacus 'Notwoodthree' Blue Chiffon™. You may recognize the genus name as being the same as that for the hardy hibiscus flowers that are nicknamed "dinner-plate hibiscus." Blue Chiffon is the brand name, while the rarely used 'Notwoodthree' is the cultivar name. Another common name for this species is "shrub althea." Blue hibiscus flowers adorn Hibiscus syriacus Blue Chiffon from mid-summer into fall. The flower's color is violet-blue. As with other hibiscus flowers, a striking stamen protrudes from the center; and the centers are stained a burgundy color, which "bleeds" outwards, terminating in rivulets. But Blue Chiffon offers a piece de resistance, as the white stamen is surrounded by a cluster of smaller, inner petals (also violet-blue in color) that gives these hibiscus flowers a frilly or "double" appearance. The shrubs stand 8 to 12 feet tall, with a spread of 6 to 10 feet at maturity. Hibiscus syriacus Blue Chiffon grows best in USDA planting zones 5 to 8. Grow this plant in full sun to partial sun and in well-drained, loamy soil enriched with humus. With its blue hibiscus flowers, this bush is attractive enough to be used as a specimen. You can also plant several of the shrubs together along a border to form an ornamental hedge. However, because it is a deciduous shrub it makes an effective privacy hedge only in summer, when it has leaves. Mulch the shrubs for weed control and to maintain moisture in the soil. The bushes are fairly tolerant of dry conditions once established. In fact, yellowing leaves on althea can be an indication of too much water rather than too little. Aphids and Japanese beetles commonly attack the plants. Spray with neem oil for aphids; remove Japanese beetles manually. These plants are susceptible to leaf spot and canker, both of which can be dealt with by removing infected parts before the disease spreads (if you spot the problem soon enough). Since it is one of the shrubs that bloom on new wood, Hibiscus syriacus is normally pruned in late winter or early spring. Pruning often is not necessary, although you may choose to prune for shaping purposes or, on old shrubs, for rejuvenation. Hibiscus syriacus Blue Chiffon is a plant that attracts butterflies and is useful in hummingbird gardens. Fortunately, rose of Sharon shrubs are relatively deer-resistant. Numerous and attractive flowers are a hallmark of the species, as is a late blooming period. Because they are late summer flowering shrubs, these plants are able to offer color in late summer and early autumn, when many shrubs have long ceased blooming. But Blue Chiffon offers an improvement on the species: its "double" hibiscus flowers. While the flowers are sometimes only blu-ish, at best, when fully open (the closed blooms appear bluer than the open ones), the fact that they are double is a major selling point.